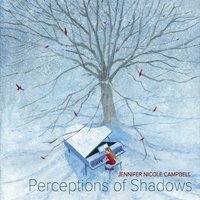 Delaware Arts Info: Album Review: Jennifer Campbell, "Perceptions of Shadows"
Album Review: Jennifer Campbell, "Perceptions of Shadows"
It might seem a bit presumptuous for a young pianist to include her own compositions on her debut CD and to christen the project with the title of one of said works. But Jennifer Nicole Campbell is not just any other pianist. Barely out of conservatory (Peabody Class of ’14) — this young artist must surely possess a bookshelf sagging under the weight of the awards she’s already won. Those talents are brilliantly displayed in this “a-little-bit-of-everything” recording, the 10 tracks of which range from the baroque to the contemporary. Campbell was assured and absolutely engrossing in Beethoven’s Sonata No. 30 in E Major (Op. 109) and Chopin’s Nocturne in C-sharp minor, Op. 27 No. 1. The former was written in 1820 when Beethoven was completely deaf. After the huge Hammerklavier sonata (Op. 106), this work marks a return to a smaller and more intimate character, one might even say, confessional. Campbell applies an appropriately gentle touch to the first movement before launching into the ferocity of the second. The calm and fragile tone of the cantabile theme of the final movement — a set of variations — provides a nice and welcome retreat. Chopin was undoubtedly the master of the piano miniature and his Nocturnes are the best of the best. Some are profoundly beautiful while others, like the Nocturne in C-sharp minor (Op. 27, No. 1), express pathos, tragedy, even hopelessness. Written in 1845 when the composer knew he was sick with tuberculosis, this is as personal a statement as Beethoven’s Missa Solemnis. Campbell’s approach is emotional without being sentimental, balanced and clearly shaded, allowing the music’s passion to emerge. No matter. Campbell displays a firm grasp of Bach’s architecture, delivering a performance of the French Suite No. 3 in B minor that is appropriately sharp in contour with plenty of vibrancy and poignancy. Campbell shows equal mastery of the music of Debussy. Her control of voicing in “Cloches a travers les feuilles” from Images, Book II is a marvel as is her ability to coax some breathtakingly subtle shades from her instrument. Campbell is equally brilliant as she evokes the shimmering luminosity of the technically daunting “Sundrops over Windy Water” from Three Etudes (2012) by the young Israeli composer Avner Dorman. The inclusion of David Auldon Brown’s Sonata I (1977, rev. 2008) was a splendid example of the contemporary idiom to the traditional sonata form. The composer revised the work especially for Campbell during her study at the Darlington Arts Center.